David Abrams served in the U. S. Army for twenty years and was deployed to Iraq in 2005 as part of a Public Affairs team. Much of that experience was used for his first novel Fobbit and for stories published in Esquire, Glimmer Train, Narrative, and other magazines. His new novel, Brave Deeds (Grove Press/Black Cat, 256 pp., $16, paper) takes place during one long day in Baghdad during which just about everything that could go wrong does go wrong. I’m much reminded of William Faulkner’s As I Lay Dying, in which a \funeral dominates the narrative. The main difference is that in Faulkner’s novel the body of Staff Sgt. Rafe Morgan is not dragged on a long, dusty walk made necessary by the malfunction of a Humvee. As I Lay Dying is dark comedy classic, which Brave Deeds seems likely to become. We get to know a squad of six soldiers about as well as a reader could in the span of this short book about perseverance and people being where they have no business (or proper preparation) to be. The squad’s predicament is funny or we wouldn’t be able to stand reading about young men who are lacking in what it takes to be modern day Lawrence of Arabias. These are deeply troubled young men: Cheever—fat and whining about his sore feet—is no worse than the other five, just more annoying and irritating. This is a dark, deeply sad book, but mostly I recollect how funny many of the scenes were. A beat-up old van full of flowers and a pregnant stowaway who is about to give birth—very funny and beautifully observed by the author. The six young men walk west across war-torn Baghdad, making fish out of water seem the most comfortable and positive and hopeful of clichés. How can they not all die horrible deaths? Reading Louis L’Amour novels, going to Rambo and Tom Cruise movies, and watching “mud-streaked men straining up a jungled hill with Mel Gibson toward their deaths in We Were Soldiers” has not prepared them for this war. One chapter is entitled “This Ain’t No Movie,” and my one thought upon seeing that heading was: That’s for damned sure. I’ve never seen—nor do I want to see—a movie like this book. The book is cinematic enough for me. This is the chapter in which golf gets a mention, which caught me off guard. “Casualties of war, collateral damage, battle tally” get discussed in this fine novel of modern desert warfare—discussed and portrayed as well. Read this book. Don’t send your children off to fight any war out in the desert. I wouldn’t do that to my worst enemy. 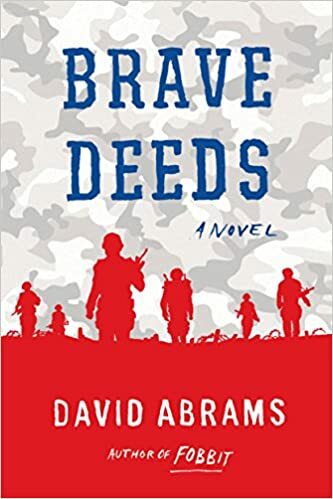 This entry was posted in Fiction, Iraq War, Novel, Paperback and tagged Brave Deeds Abrams, Brave Deeds David Abrams, David Abrams, David Abrams Iraq war, Iraq War fiction, Iraq War novel by vvaposted. Bookmark the permalink.